Ginette Spanier, circa 1960. The Anglo-French Spanier (1904-1988, Mme. Paul-Émile Seidmann) was the directrice of the Paris fashion house Pierre Balmain for more than 25 years, after which she worked for Nina Ricci. This photograph of Spanier—wearing a Balmain evening dress, of course—appears in her memoir "It Isn't All Mink: The Sparkling Autobiography of a Woman of Style" (Random House, 1960). The highly entertaining book was edited by Spanier's lover, British journalist Nancy Spain. "Why do women want to be chic? Why do women feel like this? Why do they pay attention to their clothes? "Men say it is to attract men. Women think it is to knock spots off other women. I have my own belief. Women need the sense of security that the griffe gives them. The griffe is the little label that the couture sews into the back of the dress, with the great name (Balenciaga, Balmain) on it. "I can remember perfectly the first griffe in the first model I had. 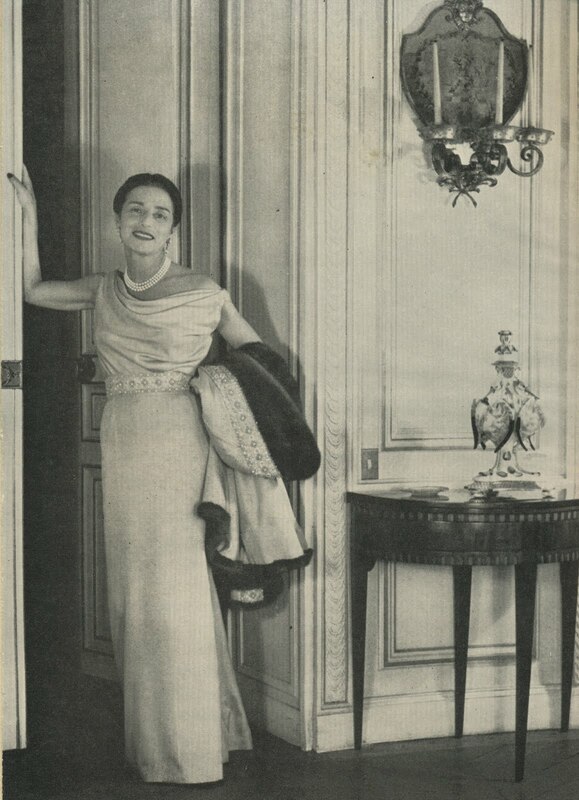 I bought the model in a sale in Cannes in 1933—a pale-pink evening dress by Worth and a coat that went with it. My dream would have been to wear the dress with the griffe of Worth outside. Indeed, I kept negligently throwing my evening coat on the back of a chair with an organized gesture. The label meant nothing to the man who took me out for the evening. It meant everything to me. It gave me confidence. It said, 'Go in and slay them, Ginette.' It helped me talk to people. It made me walk into a room with shoulders back." So wrote Jenny Yvonne "Ginette" Spanier in It Isn't All Mink: The Sparkling Autobiography of a Woman of Style (Random House, 1960). Another book I need to read, thank you for finding it! Brilliant lady, brilliant post. Yes the griffe can make you walk taller even if only you know it. What a lovely looking woman! Once again; you have sparked my curiosity.....and led me to find a book! At least I have a head start! All of the books....(every single one) you have mentioned......I have found; and LOVED. And treasure!! I think good clothes have a lot to do with "shoulders back!" Another good book. Thank you! It reminds me of my grandma who was really into jewelry and had some fabulous pieces (this is in Pittsburgh, mind you). She would always put on some major jewels before heading out just to let people know 'whats what' -even though people probably assumed many were costume! I still think that everytime I put on my 'good' watch -"let them know whats what". When I was a child, I found an autobiography of Billy Rose in the house. Rose quoted a story from Flo Ziegfeld who dressed his ladies very well. One time Ziegfeld spent an exorbitant amount on French lace undergarments, and someone took him to task saying, "...but no one will ever see them." Flo said, "Yes, but the ladies will know they are wearing them, and they will walk differently." Same thing. The confidence of knowing you have quality. I may as well through in another quote from the same book. Billy Rose said, "If you only have $5.00 to spend on a woman for a gift, then buy her an extravagant $5.00 something....not a $5.00 handbag, but a $5.00 bar of imported soap. " Take into account inflation and you get the drift. I wonder what my parents did with that book? I was too young to be reading it! Vogue invited me to this symposium (because the lady who I bought my "nylons" (anyone alive who knows what that was?) at I. Magnin recommended me to Vogue. She was old.....and no one paid any attention to her....except when I went in to the interview....Lordy!!! The head of I. Magnin picked me! What an experience! Anyway, It was a "symposium" and we were asked what "labels" meant..and each of us had a different opinion. "Style"; "fashion"; fascinating! I may have to do a "blog" on this! Actually.....should I just quit blogging? There are so many amazing blogs....I can't even read them all. I am honestly asking your advice. Should I just stop trying to write one a week. And just read them? "1/3stories about crap somebody cooked, knitted or sewed"
next 1/3 self -promotion! (buy my painting! and the other third...".conspiracy theories"
You have a wonderful blog that I enjoy and respect so much! I know you will answer with the truth....I just want to make sure that you know I want the real truth. Would you suggest I continue? You are king of blogs. That is why I am asking you!